I would just like to say how impressed I've been with the way the children have settled back in to the routines and expectations of school life. School is full of energy and enthusiasm and already, the classes are settled and happy. A special mention goes out to our new Reception children. What a wonderful start to school life they have already made. Buddy, our school therapy dog, paid a special first visit to the new classes and was greeted with lots of enthusiasm, strokes and cuddles. Thank you to Mrs Roberts, Miss Cross and the team who have done a marvellous job of welcoming and settling our new starters. I predict a very exciting year ahead! In our first assembly of the year, the children gave thought to our school ethos and vision, considering the 'fullness of life' and what really counts as being rich. Ask them about "Penny Poor & Richie Rich" and how we learnt that a life full of love and hope and someone to share it with is far more valuable than material possessions. 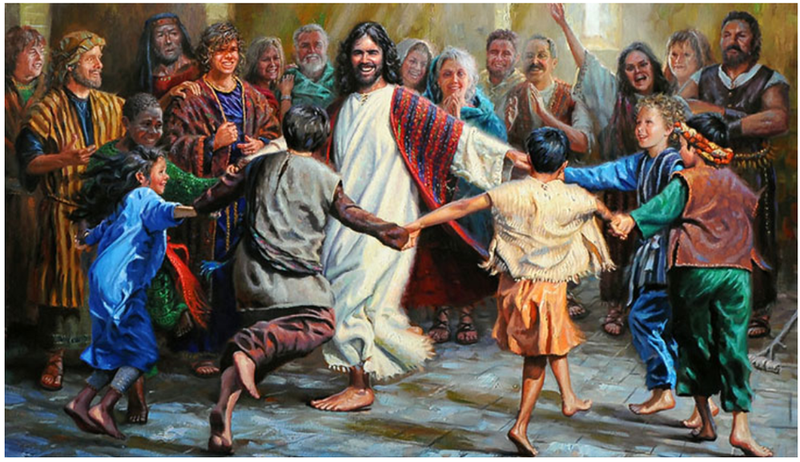 This painting of Jesus illustrated the message of life filled with joy and riches and helped us think about how there is much more to school life than English and maths.